A fiesta of flavors and colors, these oven-baked, chicken stuffed poblano peppers are delicious, gorgeous, and healthy. A fiesta of flavors and colors, these stuffed poblano peppers are incredibly flavorful. And they are so pretty! Whenever I make them, everyone raves about them. It’s a surprisingly easy recipe. Cook tomatoes, onions, garlic and spices in olive oil. Remove from heat and mix in cooked shredded chicken and mozzarella. Stuff the mixture into poblano peppers and bake. Then sprinkle cheddar cheese on top and broil just to melt the cheese. For the detailed instructions, scroll down to the recipe card. Are poblano peppers very spicy? Poblano peppers have a rich flavor, a meaty texture, and mild to medium heat, depending on the particular pepper. Three of us loved the extra heat. One of us – the one who’s under twelve – said she would have preferred stuffed bell peppers instead of these stuffed poblano peppers. 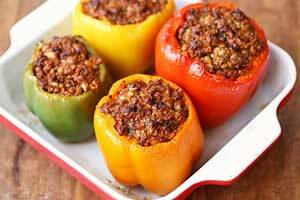 If you’re not fond of spicy foods, you can certainly use the same tasty chicken filling to stuff sweet bell peppers. You can serve them as an appetizer, one per person. But I often serve two per person as our main course, with a simple side such as a tossed green salad or a quick tomato salad. Can I use a different cheese than those listed in the recipe? Absolutely! This stuffed poblano peppers recipe is very flexible and forgiving. You can use any melty cheese that you like instead of the mozzarella and cheddar. Fontina, asiago and provolone will all work beautifully in this recipe. You can also replace the mozzarella, or part of it, with softened cream cheese. Reviewers of this recipe on Pinterest have made all sorts of yummy substitutions, with great success. Having said that, I first published this recipe in 2014, and I’ve played with it a lot over the years (I can’t even follow my own recipes!). 😀 But I do like it best when I make it as originally written. I believe it is. Peppers are very healthy. Chicken and vegetables (onion, tomatoes) are nutritious. And happily, current research says that cheese is pretty much harmless for healthy people. So yes, I consider these stuffed poblano peppers as healthy. Keep leftover stuffed poblano peppers in the fridge, in a sealed container, for 3-4 days. Reheat the leftovers in the microwave, covered, on 50% power, or in a 300°F oven. As mentioned above, stuffed bell peppers are wonderful. I stuff them with a seasoned mixture of ground beef, but you can stuff them with the chicken mixture used here. 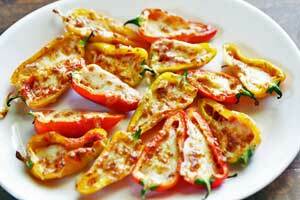 Another very good – and easy – pepper recipe is this recipe for roasted bell peppers. It’s one of my favorite side dishes! Oven baked chicken stuffed poblano peppers are delicious, gorgeous, and healthy. Preheat oven to 400 degrees F. Line a large baking sheet with foil and brush it with a little olive oil. Rinse and dry the poblanos. Cut a thin slice off the tops and remove the core and seeds. Cut a slit down the side of each pepper. Set aside. Heat the olive oil in a large, deep skillet over medium-high heat. Add the tomatoes, onion, garlic, oregano, cumin and salt. Cook, stirring often, until liquids have evaporated, about 7 minutes. Off heat, stir in the chicken, the mozzarella and the cilantro, mixing well. Divide the filling among the peppers, adding it from the top and pressing on it to fill the entire pepper. Place the stuffed peppers on the prepared baking sheet. Bake until the poblanos are soft and charred in places, 20-30 minutes (the smell will be amazing!). Remove the baking sheet from the oven and switch the oven to broil. Top the peppers with the cheddar cheese and broil just until the cheese is melted, about 2 minutes. Let rest 5 minutes before serving.